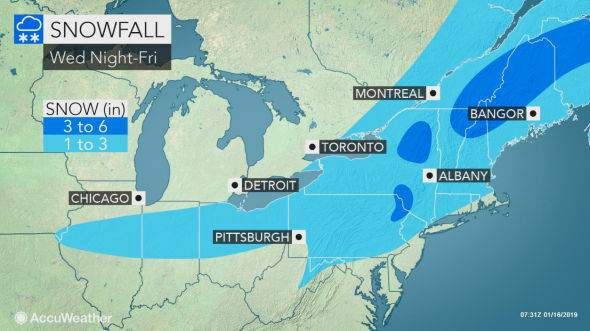 The first onset of winter weather is well on its way to landing in New Jersey on Thursday night, creating the potential for a confusing pendulum on Friday morning, but the latest forecasts from the National Weather Service show that the state is on the weekend could spare a big blizzard with temperatures expected to stay above freezing. New Jersey is not out of the woods yet for weekend weather. The National Meteorological Service still calls it a "significant winter storm", which is expected to arrive on Saturday night, and a deep fall in Sunday's temperatures at the tail end of the storm could lead to icy-cold weather. There is still a chance that an explosion of Arctic air might penetrate earlier to deliver a wintry mix, the weather service says. Since the system is still out of the system for a few days, predictors say track and timing are unclear. Immediate concern is the fast-moving Thursday night storm, which could drop as much as 4 inches of snow in western Passaic County and 2 to 3 inches of snow in Sussex County. Areas along the I-95 Corridor could be 1 to 2 inches, the National Weather Service said Wednesday morning. In the north of Jersey Shore and in the interior of South Jersey, there will probably be less than an inch of snow, with rain in Atlantic City. Predictors warn that commuter traffic on Friday morning may be difficult in many areas of the state before the storm quickly clears our territory. While the National Weather Service says at least some snow is visible in the Atlantic and Cape May counties, AccuWeather.com says that much of the state can receive mixed rainfall.